I suppose this post might have been most useful pre-Valentine’s Day, but heck, I had leftover strawberries. This dessert is simple and requires few ingredients, so its a cinch to whip up for a romantic dinner for two, with leftovers of course. I really love the addition of black pepper, I think it adds a great layer to any strawberry dessert. You can omit it, of course, if you’re feeling more traditional. I used a heart cookie cutter to form the almond flour biscuits, but you could choose another shape or do a simple round biscuit by forming it in your hands. What really makes this dessert is the homemade whipped cream, which is so simple that there’s no reason to every buy the storebought variety again. You want a heavy whipping cream, full fat. Use a local, organic variety if at all possible. In Houston, I like Mill-King and it is readily available at Whole Foods. In a medium bowl mix together the almond flour, coconut flour, baking soda and sea salt. Whisk together the honey and melted butter or coconut oil, then add in the eggs and vanilla until well combined. Stir the wet mixture into the dry until incorporated. Shape the dough into a ball and chill for 15 minutes. In the meantime, make the whipped cream. Add the first two tablespoons of heavy cream to the bowl of a standing mixer along with the honey and vanilla and blend on high speed. Add in the remaining cup of cream and continue to mix on high until stiff peaks form. Place in the refrigerator in a sealed container until ready to use. When the dough is chilled, take out of the fridge and divide into six parts. Shape into balls and place each one on a parchment-lined baking sheet, then flatten to about an inch thick. Or, if you prefer, roll out the dough and cut into desired shapes. Bake 10-12 minutes until golden. Allow to cool. While biscuits are cooling, prepare the strawberry topping. Stem and slice the strawberries and place in a bowl with the maple syrup, vanilla and black pepper. 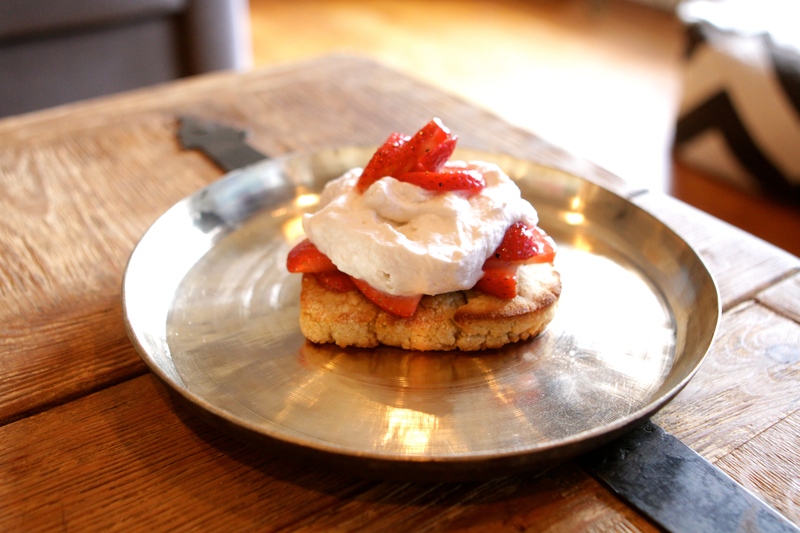 Cut the biscuits in half, then layer with the fresh whipped cream and sliced strawberries. Enjoy!